Hey guys! Well some big improvements here! I finally got into the Creation Kit with my mod and made an awesome discovery. The "Extra Thunder" sound files in my mod had no trigger assigned to them. This means you never got to hear them :( Good news! I've now assigned a trigger for the extra thunder and it sounds excellent!! So here is what you can expect from ISTV6!! 1) Extra thunder files have now been given a trigger event and will randomly play during rain storms! 2) The extra thunder sounds that play are random each time!!! Real happy about this one! 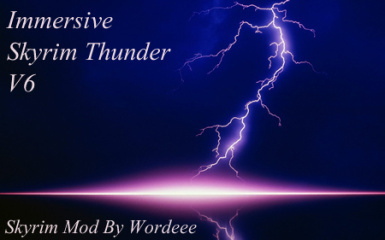 3) With the creation kit, ive enabled a greater variety of thunder sounds by merging distant and extra thunder sounds together! 4) Rain files have also been maintained with extra thunder sounds added to them. I'm really happy with V6. After listening to it, and testing it, the variety of thunder is great! I think its a big improvement over V5 with the added "extra thunder" sounds now working. They crash out of no where to and it sounds excellent! I hope you guys enjoy this! 1) If you have ISTV5 installed, remove it. 2) Enable ISTV6 with Nexus Mod Manager. 4) Turn up your volume and enjoy the rumble! Thanks for downloading and endorsing guys! I hope you enjoy ISTV6!